We offers a technically advanced Structured Packing in single piece with assured performance in Process column for solvent purification by Distillation or solvent recovery by Absorption. Structured packing refers to a range of specially designed materials for use in absorption and distillation columns and chemical reactors. Structured packings typically consist of thin corrugated metal plates or gauzes arranged in a way that they force fluids to take complicated paths through the column, thereby creating a large surface area for contact between different phases. Structured packing is formed from corrugated sheets of perforated embossed metal or wire gauze. 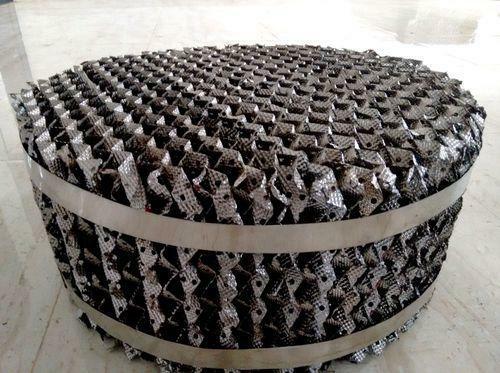 The result is a very open honeycomb structure with inclined flow channels giving a relatively high surface area but with very low resistance to gas flow. The surface enhancements have been chosen to maximize liquid spreading. These characteristics tend to show significant performance benefits in low pressure and low irrigation rate applications. Typical applications include vacuum and atmospheric crude oil fractionators, FCC main fractionators and TEG contactors. Structured packing is manufactured in a wide range of sizes by varying the crimp altitude. Varun Engineering was established in the year of 2000. We Varun Engineering are a renowned organization in the market engaged in manufacturing, exporting and supplying a wide assortment of Chemical Processing Equipment, Filtration Separation Equipment & Metal Tower Packing Equipment. We are facilitated with a world-class infrastructure, which is equipped with state-of-the-art machinery and equipment. This enables us to offer superior products to our clients which have advanced technology as well as match with the latest market developments. Besides, these are tested at various levels by our experienced quality auditors in order to assure optimum quality. Our quality range of products, timely delivery and easy payment options enable us to build a vast customer base across the country. We export our products to all over the Indian Subcontinent. We are a client centric organization and believe in providing maximum satisfaction to our clients. Our organization believes in following ethical business practices and maintaining transparency in our deals. Being a leading organization in the market we offer top grade products which are fabricated using raw material sourced from highly reliable vendors in the market. Our organization's competitive advantage encompasses, the experienced Research and Development unit of our organization, large product line and Total Quality Management. We have a wide distribution network which enables us to deliver the products to our clients within the stipulated time frame. Our organization is financially stable and believes in offering maximum value to our clients money.